This side-notched point was found in 1985 on the DeMoss burial site in west central Idaho. Fourteen other side-notched points and 20 side-notched point preforms were also found on the site. It represents one of a group of points that are assigned to the northern side-notched cluster. However, it might be difficult to identify specifically. As Noel Justice explains (2002), "To little is known at present to differentiate new side-notched types with discrete hafting attributes or tighten the definitions of Bitterroot (points) and Cold Springs (points) to possibly differentiate them from Northern (side-notched points)." Northern side-notched points were named for examples found at Wilson Butte Cave in south central Idaho. The type description matches several of the points found on the DeMoss site. The DeMoss site is a Cascade Phase site that produced 22 Cascade points. Cascade and side-notched points occur together on some late Cascade Phase sites. Side-notched points become the dominant type in the next phases. Although this point may appear to be an arrow point, there is no clear evidence for this. Because of its 6,000 year old age, it's thought by some to be a dart point that was propelled with a spear thrower (atlatl). Northern side-notched points date to between 8,000 and 6,000 years ago (Justice 2002). The ability to identify or prove whether a stone projectile point was used on an arrow or spear is difficult without organic remains. Atlatl weights and shaft straighteners are rarely found but they can be helpful clues. Identification is all the more confusing in some areas in the west and northwest, where it's believed both spear and bow and arrow were used at the same time, during some time periods. One edge of this point was skillfully finished with a row of parallel oblique flake removals. Oblique flaking is a characteristic that is also seen on Cascade bifaces. 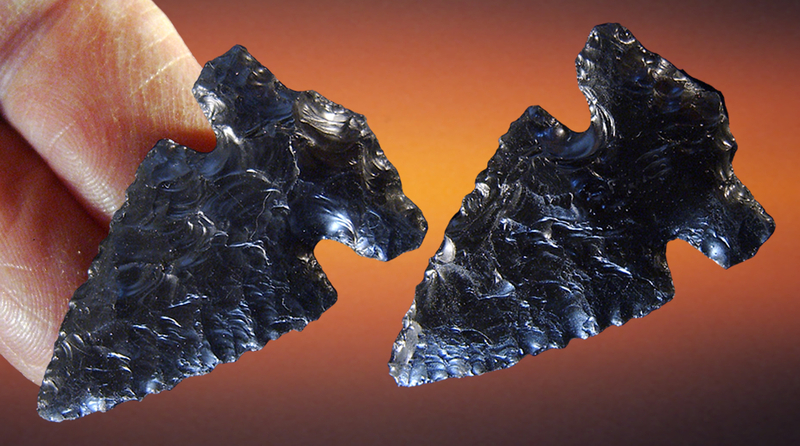 This point is made of black Obsidian and measures 1 3/8 inches (3.5 cm) long. The DeMoss site was accidentally discovered when a backhoe exposed a large number of artifacts during the excavation of a spring. This is a late Cascade Phase site that dates to 6,000 years ago. A minimum of 236 Cascade points, side-notched points, and bifaces were found along with the bones of at least 60 individuals. Nine percent (22) of the artifacts were identified as Cascade points. All of them have some diagonal pressure flaking.